All week we have been talking about Valentine's Cards. We have shown many different options for both teachers and students. So I figured I would share my daughter's idea of the perfect Valentine. Kaitlyn is 4 and this is her first year at Pre-K so this is her first experience with the Valentine's Day Card exchange...and to put it mildly she is over the moon excited. Believe it or not Valentine's Cards are a great skill reinforcer and help with a multitude of basic skills your child should know before they enter school. Have your child be part of the process. Have your child decide what type of Valentine they want for their classmates, We opted for no candy so once that was off the table my daughter settled on crayons pretty quickly, her second fave was paint....yikes! Crayons are a preschoolers favorite, they are just learning to color, they enjoy letting their imagination run wild on paper, and sometimes the walls. Bake at 250 degrees for 10 minutes or so, once cool, just pop out and place in a plastic baggie. I designed the Valentines (It's kinda my thing...you can see my stuff at magic by marcy) with Kaitlyn's help, she was like a kid in a candy store picking her favorite designs. Once printed I sat my daughter down to address them to her classmates. Being able to transfer information (in this case letters that form a name) offers children valuable practice and should not be eliminated. I can't tell you how many times in first grade I would have parents send in a bag of candy and a box of unopened, unaddressed Valentine's cards. As a teacher it drives me nuts! Let your children take ownership by being a part of the process, even if it takes you a few extra minutes...I promise it is worth ten fold the amount of headache it may cause. 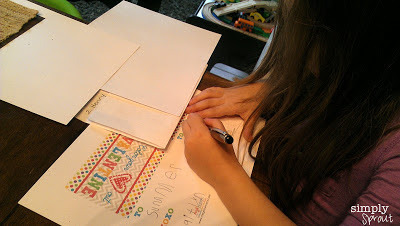 To help little ones focus without getting overstimulated isolate the name they are working on, fold the paper or use index cards to hide extra information. Have them say each letter as they write it, they can even make the sound as they form the letter. This helps reinforce letter recognition and sounds. You can also watch how they are forming their letters and help with any "bad writing habits" they might be forming before they become habit....be careful not to be too critical. Before you know it you are done your child has one of a kind cards that they helped to make, I just know how excited she is to pass out these to her classmates, after writing their names and hand picking each color for each little friend, I know this will be a day to remember for her. Her class celebrates with a few small treats and each of the children take turns passing out Valentine cards to their classmates. 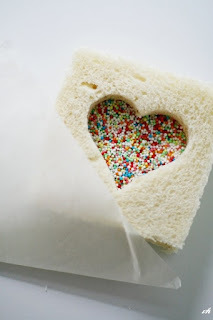 I have signed up to bring in the Strawberry cream cheese sandwiches...heart shaped of course. I am hoping I can channel my inner Pinterest guru and create the ones below....we shall see. Hopefully it is not a pinstrocity!